Regardless if you know how to use them properly or not, the chopstick has become a common utensil within Asian culture and within restaurants across the world. The chopstick can be used to eat an entire meal, or only portions of a meal. Most restaurants across the world that use chopsticks also offer forks, knives, and spoons, just in case your chopstick skills are not up to par. 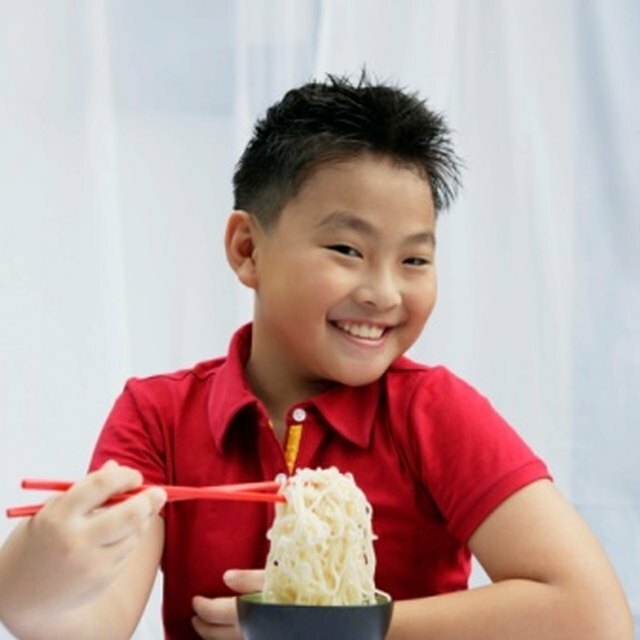 Noodles are often eaten with chopsticks. Although no one knows for sure, chopsticks are thought to be more than 5,000 years old. Originating from China, chopsticks began to spread to Korea, Japan and Vietnam by 500 AD. Chopsticks were initially used as sticks to retrieve food that had been cooked in a pot or fire. Due to a shortage of fuel, food was sliced into smaller portions before being cooked, eliminating the need for knives. As a result, the chopstick became the utensil of choice. Theory has it that Confucius encouraged the use of chopsticks over knives, claiming knives were a type of weapon and had no business at a dining table. Chinese chopsticks are referred to as kuai-zi, which translates into quick little fellows. Traditional Chinese chopsticks are 9 to 10 inches in length, while Japanese chopsticks are shorter. Traditional Japanese chopsticks intended for males are 8 inches. Those intended for females are 7 inches. It was not until 1878 that the Japanese introduced the first disposable wooden chopstick, known as wari-bashi. Chinese chopsticks have a rectangular shape with a blunt end, while Japanese chopsticks are more rounded with a tapered point. Unlike Chinese chopsticks, Japanese chopsticks didn't always break apart, but rather stuck together like a pair of tweezers. Chopsticks are typically made from bamboo due to the fact that bamboo is easy to split, rather inexpensive to produce, and resistant to heat. However, many other materials have been used to construct chopsticks including teak, pine, bone, cedar, and sandalwood. Other types of chopsticks have been made from ivory, gold, silver, bronze, coral, jade, brass, and agate. Ancient bronze chopsticks have been discovered in China, dating back to the Shang Dynasty. Within the Asian culture, chopstick usage contains a superstitious element. For example, uneven chopsticks are a sign of a bad travel experience to come. Those who sit at a table with uneven chopsticks are destined to miss the next boat, plane or train they were supposed to catch, according to superstition. Those who drop their chopsticks to the floor will have bad luck in the near future. Those who dine in Dim Sum restaurants may cross their chopsticks -- and place them in clear view -- as an indication to the waiter that they are done eating, and ready to pay the bill.